Whenever there is a huge street protest in Haiti, notice how many media send an army of journalists into the streets for a full complete live coverage. Apart from Carnaval in Haiti, how many other times do you notice such a wide media coverage in the country. Even international journalists fly in for the big party! The sky is falling... Take your seats!!! A microphone and an audience in Haiti is power... Unfortunately, it is also power to destroy for profit. Who cares about the people? It's all about the Benjamins! 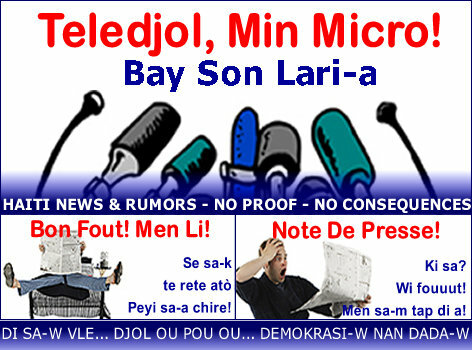 Very Good and Informative article, "To Hell with the Country: The Haitian Media loves a Good Crisis!" Respectfully, but "I opine:" To castigate and attack the Haitian and Worldwide Media for reporting what's happening in Haiti is wrong and won't solve the Haitian problems that bring the Media coverage. Could not picture it better. Haitian media is worse than the petrogangs. They contribute more to the country downfall.